Twenty-four hours after releasing the pop ballad “Assurance” which he dedicates to his significant other – Chioma, Davido has just released a befitting video for the record. The single was released yesterday (April 30) in commemoration of Chioma’s 23rd birthday. 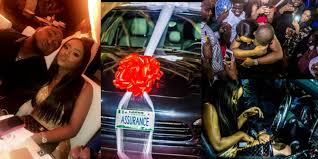 Davido who has fallen head-over-heels threw also threw a lavish birthday party and gifted her a brand new Porshe. Of course, the video features cameo appearances from the damsel.